1. 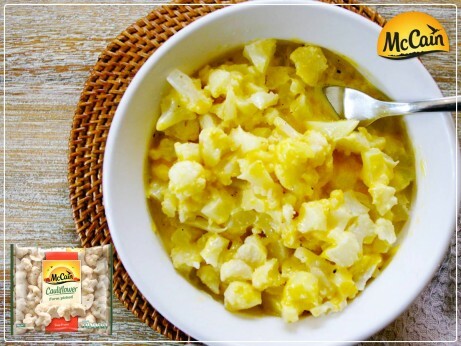 Cook McCain Cauliflower according to packet instructions, chop into macaroni sized shapes and season with salt and pepper to taste. 2. Place cream, cheese, onion powder, garlic powder and cinnamon or nutmeg into 2-cup microwave safe bowl and stir to combine. Add cauliflower and stir to coat. 3. Return cauliflower to microwave for 30 seconds, stir and serve immediately. 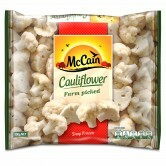 1 Cook McCain Cauliflower according to packet instructions, chop into macaroni sized shapes and season with salt and pepper to taste. 2 Place cream, cheese, onion powder, garlic powder and cinnamon or nutmeg into 2-cup microwave safe bowl and stir to combine. Add cauliflower and stir to coat. 3 Return cauliflower to microwave for 30 seconds, stir and serve immediately.